In Lancaster, Calif., Democratic congressional candidate Katie Hill stands for a selfie with Tommy Tucker, a resident who says he will vote for her. Ms. Hill is competing for California's 25th district against Republican incumbent Steve Knight in one of several races where women on the left are mobilizing voters for the Nov. 6 midterms. by Tamsin McMahon in Newport Beach, Calif.
Eileen Padberg, 74, has dumped her affiliation to the GOP and registered as an independent. The 48th district in California is one of several Republican-held seats in the state that democrats are targeting and hoping to flip. Orange County residents attend a ballot party in Newport Beach on Oct. 18. Attendees are shown sample ballots to decide how to vote. Election workers put together hundreds of polling location kits at the Orange County Registrar of Voters facility in Santa Ana, Calif.
Sheila Bigelow, left, smiles for a photo with Democratic congressional candidate Katie Hill. Ms. Bigelow voted for Donald Trump in 2016, but changed her mind about the Republican President soon after election day. Jill Wilkinson, left, is soon to be president of the Republican Women's Club in Birmingham, Mich., where she lives. Lori Goldman, right, who lives in nearby Bloomfield Hills, was mobilized to start a pro-Democrat group called Fems For Dems after the 2016 election. Both women agree that the Trump era has changed the political experience for many women in their district. Lori Goldman recalls the doom and gloom in the hours after the 2016 election, as women in her Facebook feed posted they couldn’t bring themselves to get out of bed. But Ms. Goldman, apolitical for much of her life before starting a women’s group earlier that year to support Hillary Clinton, saw opportunity in the despair. 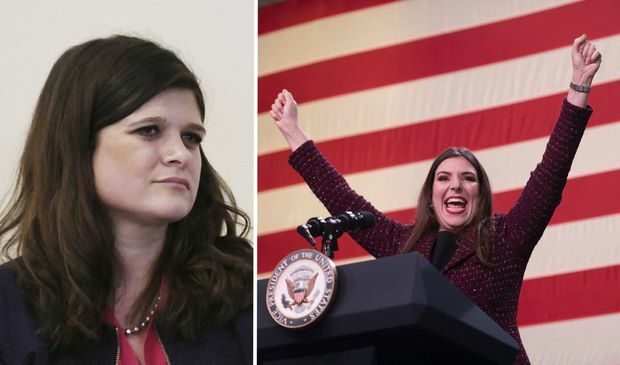 Instead, she explains, she responded to Donald Trump’s stunning victory – the first Republican presidential nominee to carry Michigan in almost three decades – by reaching out to every woman she encountered. Her fledgling organization Fems for Dems, which began with her immediate social circle, has now grown to a volunteer force with a 1,500-strong e-mail list, as it runs candidate meet-and-greets, phone banks and canvasses ahead of the Nov. 6 midterm elections. At a Fems for Dems phone-bank event in Troy, Mich., locals make phone calls for the One Campaign for Michigan, a Democratic initiative to join candidates together on one ticket. Jill Wilkinson remembers the same response to Mr. Trump’s win very differently. She wasn’t prepared for what she saw when she went to her gym in neighbouring Birmingham the following morning. To Ms. Wilkinson, set to take over as president of the Birmingham Republican Women’s Club, “the weeping of the next day has only fed on itself like a cancer.” She isn’t a fan of Mr. Trump’s personality, but loves his policies – especially tax cuts that help her business – and resents being castigated by friends and family for refusing to express anything but hatred for him. Ms. Wilkinson and Ms. Goldman (who does not weep when discussing Mr. Trump and his supporters but does use some profanity) may not agree on much politically. But one thing to which they will both attest is that the Trump era has caused many women here to experience politics in a new way. Elections and political activism have at once become more divisive and more unifying, more exhilarating and more anxiety-inducing – and more a part of the identity of people who previously avoided discussing politics in polite company. It’s a shift that’s likely to last beyond Tuesday’s vote – perhaps even Mr. Trump’s presidency. ... and on Lori Goldman's yard in Bloomfield Township. Among the dominant storylines this U.S. campaign season is that their demographic – white, college-educated, suburban and female – represents the most important group of swing voters. If enough such women migrate to the Democrats out of distaste for Mr. Trump, opinion research suggests, they will play a decisive role in wresting control of Congress from the Republicans. That certainly applies to Michigan’s 11th district, where Ms. Wilkinson lives and volunteers and where Ms. Goldman’s Fems for Dems bases much of its activism. Until recently, it was reliably Republican, partly because it was drawn that way by the state legislature. Mr. Trump carried it by five points in 2016, and congressman Dave Trott was re-elected by a wider margin. But it has long been moderate in its conservatism and has been inching toward competitiveness, which both sides attribute to an influx of young families – many including highly educated women, of whom there were likely already more than in any other Michigan district. But to cast suburban women merely as targets of campaigning politicians underplays the extent to which many have actively joined the front lines of the battle for their country’s future. Both women won primaries in which older male candidates were initially favoured, a common story in a year in which there has been a massive increase in the number of female candidates, nationally and especially in this state. Haley Stevens of the Democrats and Lena Epstein of the Republicans are competing for Michigan's 11th district. Ms. Epstein notwithstanding, that change is most obvious on the Democratic side. 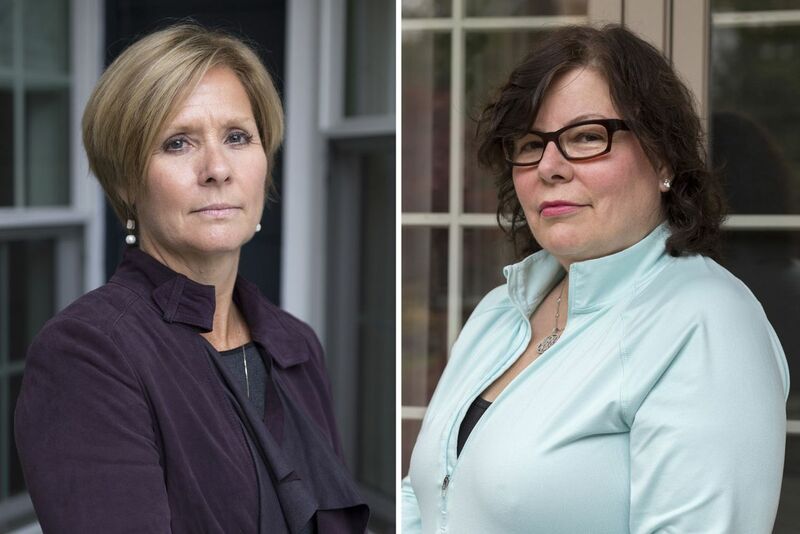 Here and in other Michigan districts, the Democratic ticket is dominated by female candidates. In addition to incumbent Senator Debbie Stabenow, that includes candidates for governor, secretary of state, attorney-general and, as an indicator of grassroots engagement, lots of women running to serve in the (currently three-quarters male) state legislature and local government. Shannon Garrett, a Michigan Democrat who co-founded VoteRunLead – a national, cross-partisan organization similarly dedicated to encouraging women to seek public office – can easily pinpoint when the wave started. Before Mr. Trump’s victory, her group would run a web seminar and about 50 women around the country would participate. The first one after his election, she says, got more than 1,000. Ms. Barnett sees something similar behind the scenes, with more women stepping into roles as campaign managers. And then there’s what is happening at the volunteer level. Suzanna Shkreli, right, a former congressional candidate for Michigan's eighth district, makes a phone call at the Fems for Dems event in Troy. The other two, Tina Catron and Catherine Bansek, are political novices. Together they answer the question: Why would women unengaged in the last election, when Mr. Trump’s style of politics (and attitudes, like those expressed in his infamous Access Hollywood tape) was well known, be much more active now? Their answers boil down to three factors frequently cited by other women who have become motivated Democrats: They didn’t really think Mr. Trump would win, they believed that if he did he’d become more conventionally presidential and, in some cases, they didn’t like Ms. Clinton either. To which Republicans respond: Not all women – at least not the same way. Deb O’Hagan, a former Republican chair for the 11th district who turns up for coffee in a car festooned with Trump-friendly stickers, acknowledges the Democratic side has been fired up in this campaign. But she contends that plenty of people are quietly very happy with Mr. Trump’s economic policies, even if they don’t like everything about him. Ms. Crandell suggests that, unlike Ms. O’Hagan, many of her party’s female supporters are deceptively restrained. “I don’t think you will ever find thousands of Republican women marching,” she says. “I do think there’s enthusiasm on the Republican side. … I just think Republicans engage differently than Democrats do,” more in keeping with traditional suburban restraint. There is also a common argument that the saga involving sexual-assault allegations against Supreme Court appointee Brett Kavanaugh accelerated a Republican awakening, about an inescapable culture war, that Democratic women had already had. 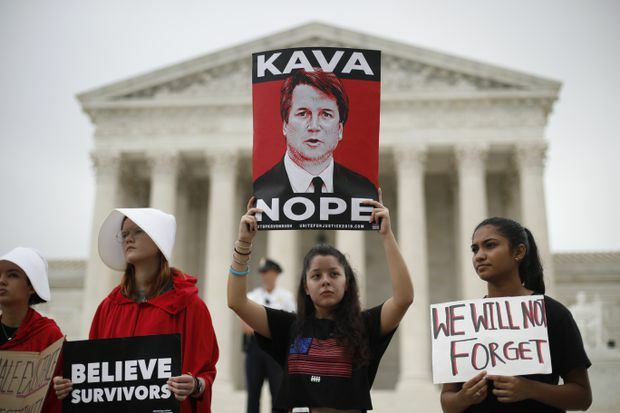 Activists protest in Washington on Oct. 9 in front of the Supreme Court, where Justice Brett Kavanaugh is now on the bench after a narrow confirmation battle in the Senate. But she doesn’t really intend to sit back after the midterms. “We’re going to take a week off,” she says, before kicking off a two-year plan to keep converting women to activism, including through a sister organization, Fems for Change, aimed at less partisan civic engagement. Beside her at Starbucks, Julie Campbell-Bode, another Fems for Dems organizer, warns about any success for her side on Tuesday allowing backsliding into apathy. Locals make phone calls at the Fems for Dems event in Troy.